"Music at that first meeting consisted of just the piano being played rather indifferently by the newly-elected president. 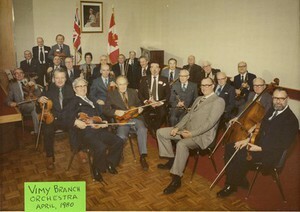 Two members, Ed Shuttleworth and Edgar Westby volunteered to bring their violins to the next meeting. Before then I discussed music with Harry Wooster and we decided to recruit more players and have a real orchestra. "Jim Bach, a friend of mine, played the cello; Roger Gardiner, a patient at Westminster Hospital, was a fine flutist, having played in the Boston Symphony Orchestra; Tommy White, a veteran, was a fine clarinetist; two militia officers, Ken Ferguson, originally played a trumpet with Lombardo, and Grant Maloney played a very sweet trombone. Then we discovered a very versatile pianist, one Wallie Armour, who had been playing professionally in Toronto. We also found that Gordon Thompson was a most competent drummer. It was then that the Orchestra was complete with strings, woodwinds, brass and percussion. "This particular combination played on a number of occasions for the patients at Westminster Hospital and the Byron Sanatorium. In the early 1930's there was a need for new Poppy boxes for the Annual Poppy Day sale and there was no money available with which to buy them. The Orchestra put on two concerts, one in the auditorium of Central Collegiate, and another in the Beal Technical School. On this last concert, I must comment. Believe it or not, we had an augmented orchestra of 51 players. 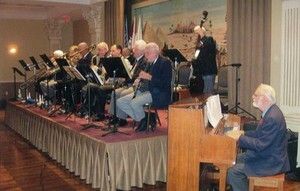 There were players from the RCR band, Al Keen's orchestra, and players from two Sunday School orchestras. The London Male Chorus and the London Little Theatre also participated in the programme. The printed programme was a masterpiece. "We never had a chance to rehearse this large organization as a group but were able to have a couple of rehearsals in bits and pieces and, most important of all, were able to give them a bit of liquid refreshment before they started. The liquid refreshments were smuggled into the sacred spaces of the Technical school by one Robert I. Watt, who, I might add, at that time, was a teetotaller and therefore, could be trusted. 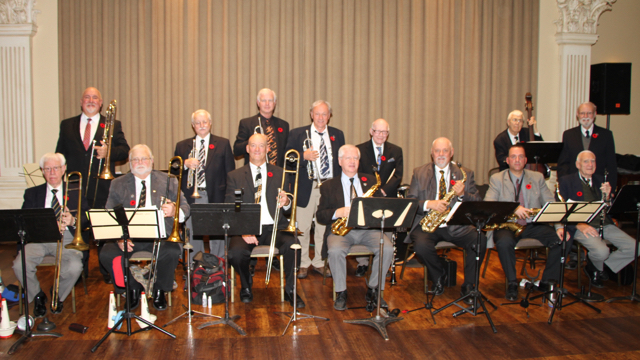 "The proceeds from this concert were sufficient to pay for the poppy boxes and a bit left over for the fund. 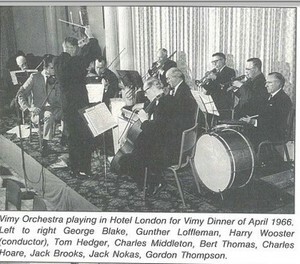 "The orchestra also performed at banquets during the dinners given at noon on Christmas Day during the 1930's in the Hotel London for the veterans who were down and out. These dinners were sponsored by the Red Cross and run by the Executive of the Vimy Branch who along with other legion members, acted as waiters and served the boys with food and beer. The orchestra played for all these occasions and it was remarkable to see the difference in the boys after the dinner and a few beers. All sorts of volunteer talent appeared and the whole gang really enjoyed a sing-song. Some of came in with nothing on but an undershirt under a tattered overcoat and in some mysterious way, they left fully clad. 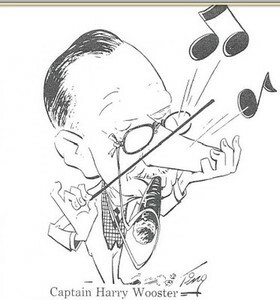 "Some time in 1934 Wally Armour left the City and we acquired a new pianist – Harry Hadwin. Like some of the original group, Harry joined the Armed Forces in 1939 and was out of circulation during the war period." "Young servicemen in London had nothing to do on Sunday nights having, I presume, done it all on Saturday night, so we offered Vimy Orchestra to entertain them in the YMCA. Ed Shuttleworth arranged for his Kiwanis Club to provide a Master of Ceremonies and entertainers. During the war a total of 103,747 men and women in uniform attended. "On week nights we played at Westminster Hospital, the R.C.A.F. Technical School at St. Thomas and the R.C.E.M.E. School at Western Fair Grounds. Adult members began leaving for military service so we recruited teenagers. Then they went into the service so we searched for more musicians. The Kiwanis Club gave us great support and bought the music. Bert Weir became our pianist. 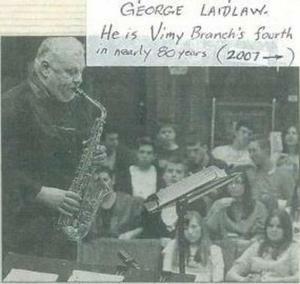 "I must pay tribute to the near perfect attendance at our concerts by Harry Jarvis, Ed Shuttleworth, Gordon Thompson, Bert Thomas, Alex Calder, George Blake, Jim Campbell, Harold Bentley, Andy McCormick, Fred Hoffman, Julius Cohen, Dunc Carswell and Dominic Cortese. If they had not been so faithful, it would have been impossible to put on so many shows successfully. Ed Shuttleworth often lead the sing songs and conducted the orchestra with his usual enthusiasm. 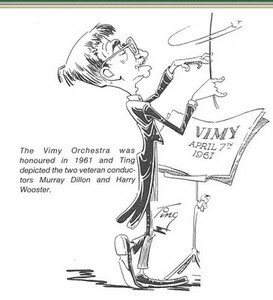 "Other members of Vimy Branch were often called on to act as Master of Ceremonies at these concerts and I recall the fine jobs done by Innes Carling, Jack Stevens, Freg Kingsmill, Ken Ingram and others. Tommy Hayman during his term as our president had to M.C. many shows and it was inspiring to see how professional he was. "At each concert the attendance by the armed forces was over the 500 mark which was all who could get in the "Y" with standing room only. We put on well over 200 concerts – all without benefit of the liquid stamina we were accustomed to at the Vimy dinners. 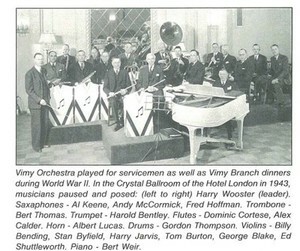 "On a few occasions since 1945 the orchestra played some Armistice services in churches. These were not highly successful. One service in St. Paul's Cathedral resulted in a competition between the organ and the orchestra. The organist sent the conductor a note which read "I can't hear the organ". The conductor wrote on the reverse side of the message "I can't hear the orchestra". (a) Sunday mornings after a tough Saturday night are not conducive to a proper mood. (b) There is no opportunity to take on the essential spiritual nourishment prior to performing. Violins – Norman Alexander, George Blake, Jack Brooke, R.M. Dillon, Tom Hedger, Harry Jarvis, H.O. Meyer, E.H. Shuttleworth, H. Wooster. *Martin Boundy is very versatile – however, he cannot play all three instruments at one time."